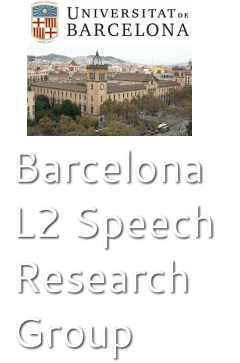 Special Session on Individual Differences in Executive Function and Phonological Processing: Implications for L2 Speech Acquisition at New Sounds 2016 (organized by Joan C. Mora & Isabelle Darcy). Click HERE for description and abstracts of talks. Seminars organized by The Speech and Sound Lab at Universitat Autonoma de Barcelona (for more info contact Juli Cebrian at juli.cebrian@uab.cat): November 13 (10-11:30, Room 206) Big data y herramientas computacionales en la caracterización prosódica by Juan María Garrido Almiñana (UPF); 20, 27 November and 4, 11 December (10-11.30, Room 504) Formació en scripts de Praat by Miguel Mateo (UB). Hanna Kivistö-de Souza will be defending her PhD Dissertation Phonological Awareness and Pronunciation in a Second Language on 27 September 2015 at 10.30 am! The defense will take place in Gabriel Oliver room (Josep Carner building, Aribau, 2, basement, in the UB Faculty of Philology. ﻿This academic year Meetings will take place once every 5-6 weeks on a Friday, please click on the Meetings tab for more information.